CHICAGO (AP) - The Chicago Blackhawks and rookie Patrick Kane were more impressed with their defense than their offense after beating the Vancouver Canucks. "Every win is huge," Kane said. 'We'll try to do things the right way to get in (to the playoffs). From defense comes offense, like the last goal today." From the edge of the crease, Ladd knocked in a rebound of Kane's shot. 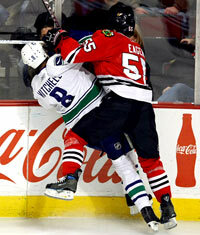 Kane set up the play when he stole the puck from Canucks defenseman Willie Mitchell in the Vancouver zone, turned and drove to the net through traffic.